The year 2013 marks the 148th anniversary of the end of the Civil War. To commemorate the anniversary of the Second Battle of Fort Fisher—the largest land-sea battle of the Civil War—Fort Fisher State Historic Site will host a living history program on January 19, 2013. Thanks to the recently released Steven Spielberg film “Lincoln” and its multiple references to Wilmington, North Carolina and the Battle of Fort Fisher, millions of movie-goers are now more familiar with the Fort’s important historical role as the last fort to fall to Union troops during the Civil War. Fort Fisher embraces this new spotlight and welcomes history buffs and fans of the movie year-round to explore its Civil War battlefield, monuments, museum, and special events. 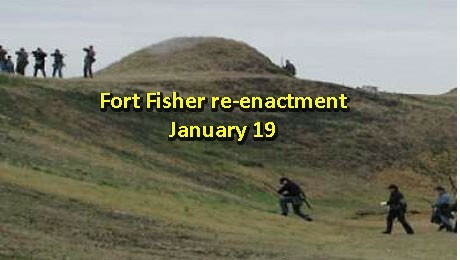 As part of the State’s observance of the Civil War Sesquicentennial, the N.C. Department of Cultural Resources’ Fort Fisher State Historic Site will host “Sheppard’s Battery: Confederates Defending the Left Flank,” a special living history program on January 19, 2013. This year’s anniversary commemoration will focus on the Confederate defenders at Sheppard’s Battery and around the “Bloody Gate” on the left flank of Fort Fisher. Reenactors will set up displays of Civil War camp life and talk with visitors about the life of the Confederate infantry and artillery troops during the January 1865 campaign. Other highlights include Civil War authors, artillery and infantry demonstrations, cannon and small arms firings, including the site’s rifled and banded 32-pound cannon atop Sheppard’s Battery. Events begin at 10:00 a.m. until 4:00 p.m. The program is free and open to the public. Volunteers in period costume will bring history to life throughout the day. Guest speakers include local historian Ernie Kniffen, who will discuss new findings on his extensive research of Confederate sailors and Marines. Author Richard Triebe will sign books and discuss N.C. troops who were captured at Fort Fisher and sent to a prison camp in Elmira, N.Y.
At 12:30 p.m., the N.C. Underwater Archaeology Unit will dedicate a new highway marker for the Civil War blockade runner Modern Greece, which ran aground and sank near Fort Fisher.